Spina bifida is a variable defect in which the vertebral arch of the spinal column is either incompletely formed or absent. The term bifida is from the Latin word bifidus, or "left in 2 parts." It is classified as a defect of the neural tube (i.e. the embryonic structure that develops into the spinal cord and brain). Neural tube defects have a range of presentations, from stillbirth to incidental radiographic findings of spina bifida occulta.The term myelodysplasia has been used as a synonym for Spina bifida.Lesions most commonly occur in the lumbar and sacral regions but can be found anywhere along the entire length of the spine. It is a treatable spinal cord malformation that occurs in varying degrees of severity. Spina bifida occulta : It can occur without neurologic defects. Meningocele : A cystic swelling of the dura and arachnoid, protrudes through the spina bifida defect in the vertebral arch. 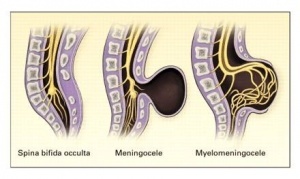 Meningomyelocele : when cord tissue extends into the meningocele. Neural tube defects occur between the 17th and 30th day of gestation. This defect then disrupts all of the overlying tissues, preventing the vertebral arch from closing.If the posterior vertebral arch and overlying tissues do not form normally, the normal spinal cord and meninges may then herniate out through the defect and cause a meningomyelocele (MMC) .If the vertebral arch fails to grow and fuse normally and the spinal cord and meninges are not disturbed, spina bifida occulta results. MMC is associated with abnormal development of the cranial neural tube, which results in several characteristic CNS anomalies. The Chiari type II malformation is characterized by cerebellar hypoplasia and varying degrees of caudal displacement of the lower brainstem into the upper cervical canal through the foramen magnum.This deformity impedes the flow and absorption of cerebrospinal fluid (CSF) and causes hydrocephalus, which occurs in more than 90% of infants with MMC .Numerous other associated nervous system malformations include syringomyelia, diastematomyelia, and agenesis of the corpus callosum. Non-neurologic associations include spine malformations, hydronephrosis, cardiac defects, and gastrointestinal anomalies. The risk of an adult with MMC having a child with a neural tube defect is 5% . Women with low RBC cell folate levels during early pregnancy have up to a 6x greater risk of having a child with a neural tube defect.Intrauterine exposure to antiepileptic drugs, particularly valproate and carbamazepine, and to drugs used to induce ovulation. Maternal exposures to fumonisins, EM fields, hazardous waste sites, disinfection by-products found in drinking water, and pesticides.Other risk factors for MMC include maternal obesity, hyperthermia (as a result of maternal fever or febrile illness or the use of saunas, hot tubs, or tanning beds), and maternal diarrhea. Measurement of maternal serum α-fetoprotein (MSAFP) levels is a common screening test. If the level is elevated, indicating that any portion of the fetus is not covered by skin, this screening test is then followed by detailed ultrasonography. Ultrasound scans will diagnose 92% of neural tube defects. Mothers with elevated MSAFP levels and a normal appearing ultrasound scan may be evaluated by amniocentesis for the presence of elevated acetylcholinesterase levels in the amniotic fluid. The Functional independence measure (FIM) is the most widely accepted functional measure. FIM consists of 18 scales scored from 1 to 7; higher numbers mean greater ability.Others include Child Health Questionnaire (CHQ), Barthel Index (BI). Generally, surgery follows within the first few days of life to close the spinal cord defect. It is also important to prevent infection and additional trauma to the exposed tissues. Additional surgeries may be required to manage other problems in the feet, hips, or spine.The individuals with hydrocephalus will also require subsequent surgeries due to the shunt needing to be replaced.Due to the bowel and bladder problems that are often caused by the neural tube defect, catheterization may be necessary. The MOMS study.The MOMS trial is an NIH-sponsored multicenter clinical trial which began in 2002 to evaluate what was the best treatment for myelomeningocele — fetal surgery or surgical repair after birth. The clinical trial results showed prenatal surgery significantly reduced the need to divert, or shunt, fluid away from the brain; improved mental development and motor function; and increased the likelihood that a child will walk unassisted. The MOMS trial has proved that some of the factors causing problems like Chiari II malformation and hydrocephalus are in fact those that develop during the second half of pregnancy. Closing the fetus’s back early may allow some nerve function to be restored in pregnancy, and actually, reverse the development of this serious condition. A multidisciplinary approach towards managing patients with MMC is essential for successful outcomes. The patient should be assessed as soon after birth as possible. At different stages, the focus of physiotherapy will change with changing needs of the patient. Regular review is essential to meet up with patient needs. Parents and caregivers should be involved in patient care. PLAN OF CARE •	Prevent/correct deformity •	Maintain/improve physiological properties of joints and muscles •	Monitor normal motor development •	Educate parent(s), caregivers •	Encourage and maximise independent mobility •	Encourage participation in regular physical activity. Common complications of MMC include the following. Neurogenic Bladder: The vast majority of children with MMC have a neurogenic bladder. Only 5.0% to 7.5% of the MMC population have a normal urologic function. Neurogenic Bowel: Traditional bowel continence is present in approximately 10% of children with MMC. Psychosocial issues: Vulnerable child syndrome. Chiari compression can occur at any time, presentation in the first year of life is associated with up to 50% mortality. Chronic headaches are the most frequently reported symptom. About 90% of babies born with Spina Bifida now live to be adults, about 80% have normal intelligence and about 75% play sports and do other fun activities. Most do well in school, and many play sports. ↑ 4. Burke R, Liptak G. Providing a Primary Care Medical Home for Children and Youth With Spina Bifida. PEDIATRICS. 2011;128(6):e1645-e1657. ↑ 5.0 5.1 5. Shin M, Besser L, Siffel C, Kucik J, Shaw G, Lu C et al. Prevalence of Spina Bifida Among Children and Adolescents in 10 Regions in the United States. PEDIATRICS. 2010;126(2):274-279. ↑ 6.0 6.1 6. Canfield M, Ramadhani T, Shaw G, Carmichael S, Waller D, Mosley B et al. Anencephaly and spina bifida among Hispanics: Maternal, sociodemographic, and acculturation factors in the National Birth Defects Prevention Study. Birth Defects Research Part A: Clinical and Molecular Teratology. 2009;85(7):637-646. ↑ 7. McLone D, Knepper P. The Cause of Chiari II Malformation: A Unified Theory. Pediatric Neurosurgery. 1989;15(1):1-12. ↑ 8. McDonnell G, McCann J. Issues of medical management in adults with spina bifida. Child's Nervous System. 2000;16(4):222-227. ↑ 9.0 9.1 Campbell, SK, Linden, DW, Palisano RJ (2000). Physical Therapy for Children (2nd Edition). Philadelphia, PA: W.B. Saunders.